Part of the show Does nature do it better? Michael - It is a pretty impressive beetle actually because it's evolved a way of harvesting its own freshwater in a desert and that is pretty remarkable. The way it does that is that it comes out of its hiding place at night, it crawls to the top of a sand dune. And then because it's got a map black shell and it's very lightweight, it's able to radiate heat out of the night sky and becomes slightly cooler than its surroundings. So then, when the moist breeze blows in off a sea, you get these little droplets of water forming on a beetle's shell. Just before the sun comes up, it dips its shell up, the water runs down to its mouth, and it has a good drink and goes off and hides for the rest of the day. And the ingenuity, if you could call it, that goes even further because if you look carefully at the beetle's shell, it's covered in little tiny bumps and those are hydrophilic, they attract water and between them, there's a waxy finish which repels water. The effect of that is that as the droplets form on those bumps, they stay in very tight spherical form which means they're much more mobile than they would be if it was just a mist over the hard shell. So, it's an example of an amazing adaptation to a very resource-constrained environment and more and more over the next few decades, we're going to be facing resource-constraints. And so, I think it's a good example of just how much biomimicry has to offer. Ginny - So, how have you copied this kind of shell to make something that's useful for humans? Michael - Yeah, sure. I think maybe we need to just sort of back up a little bit because we were trying to do a number of things on this project. We wanted to develop an idea that would address multiple challenges simultaneously. Here, we wanted to develop an integrated solution that addressed climate change, water in desert regions, generating clean energy and so on. We also had a hunch that the world's deserts could be part of the clue to providing our future energy needs because if you look at the amount of energy that falls on the world's deserts, it's really phenomenal. If we could just capture a small amount of that, that would go a long way to solving our own energy needs. Looking at an extreme environment like a desert, and you're interested in biomimicry, then you can learn a lot from the organisms that have already adapted to life there. So, that was where the fog basking beetle came in and that led us to develop a type of greenhouse which is cooled and humidified with seawater and then it condenses a certain amount of that humidity as freshwater in a process that's effectively identical to the beetle. And by making a cool, humid, growing environment, it means that the plants would actually need far less water to grow because it's humid so they transpire less. And then we could actually create a fair amount of freshwater to supply those plants with water. Ginny - So, we've been talking about a sort of closed-loop design. How is that different to the way most things are currently built and designed? Michael - Conventional human made systems tend to be fairly simple, linear and disconnected. In biology, it's completely different. They tend to be much more complex systems which are very interconnected and much more cyclical. In ecosystems, the waste from one part of that system nearly always becomes the input of a nutrient for something else in that system. Ginny - But the natural world is so complicated and interconnected. Can we ever really build anything that's going to work like that? Michael - It would be very difficult to immediately try and create a fully functioning ecosystem but what is much more straightforward is to look at how we can adapt our conventional approaches to move more towards the characteristics of ecosystems. Rather than just having a single technology in a particular place, you can look at what the inputs and outputs of that technology are and then you can see what other kind of technologies you can combine with it. So for instance, on the Sahara Forest Project, we had the greenhouse and then we looked at what other kind of technologies that would be synergistic with that and we settled on concentrated solar power, which does have some interesting synergies, both the greenhouse and concentrated solar power work very well in hot sunny deserts. 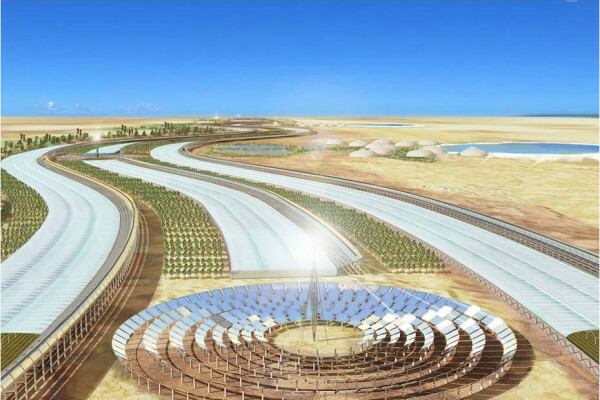 The concentrated solar power should benefit from seawater cooling. It's as much as 10% more productive in terms of energy. We could make use of all that waste heat to evaporate more seawater in the greenhouse and potentially create more freshwater. And then furthermore, the shades created by those mirrors would allow us to grow a whole range of crops underneath in the shade that would not grow in normal regions. So, it's a way in which we could create a system for growing zero carbon food in some of most water stressed parts of the planet, creating abundant renewable energy and re-vegetating areas of the desert. Ginny - That sounds amazing and obviously, it works really well in a desert where there's lots of sun and that sort of thing. But it's not really going to work here in England for example where it's cooler and more temperate. Michael - What you have to do is look at the existing climate and the resources that you have around in a similar way and there's a fantastic scheme up in Yorkshire called the Cardboard to Caviar Project which - well, the simplest way of describing it is that they collected cardboard from shops and restaurants. They then shredded that and sold it to equestrian centres as horse bedding. When that was soiled, they were paid again to collect it, the manure and the cardboard. They put it into worm composting systems which produced worms, which they fed to Siberian sturgeon, which produce caviar, which they sell back to the restaurants. So, it's a very neat example of what was a linear wasteful system becoming a cyclical system and also, creating far more value. So, they were paid in various stages along that way. Ginny - That sounds amazing. We can take something that otherwise would've been thrown away and turn it into something really expensive and that people really want. Michael - Yeah, the caviar example is a nice sort of example of alchemy really - turning something that's of such low value as cardboard into ultimately, caviar. And then there were a lot of other things that became part of that system. So, they actually transformed quite a lot of industrial land. They rejuvenated that, they planted crops that would allow them to run a biomass boiler that will keep the fish nice warm in winter so it carried on growing. They also started growing crops that they could use to make fish food and they found that there was a bakery nearby that was throwing away a lot of mouldy bread. And so, they used that to grow maggots which was another food stuff for the fish. Next How do insects hear? Is there a googol of anything? Conserving for future genetic resources?